If you’re a builder, a civil engineer, a construction professional or even a handy do-it-yourself kind of man or women, you probably already know a little about transit levels. 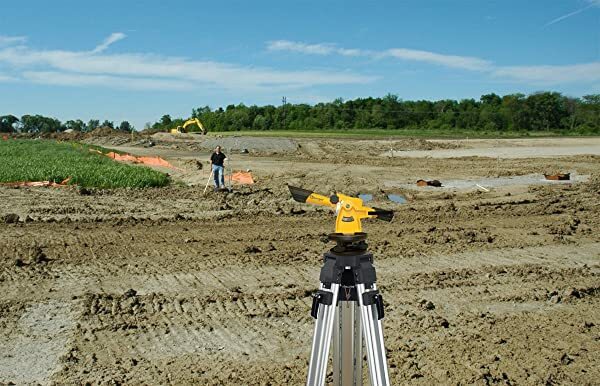 Surveyors and building contractors use them to discover contours in the land they plan to use for their construction projects. The levels locate the spots where land has to be “leveled off” before a building, a bridge or anything else can be erected. It should come as no surprise that there is a broad range of transit levels for sale at online retailers and in the brick-and-mortar walk-in store at your local mall or shopping center. So, how do you choose the best transit level for your needs? Take the next few minutes to read the remainder of this article and you will discover the top transit level reviews currently available for purchase. The below table provides you with a quick overview of the best transit levels for construction and land surveying projects. Take a long, hard look at the 4 survey transit levels described below for the help you need in determining which one is best for you. This transit level is simple to set up and easy to use for leveling and vertical applications. 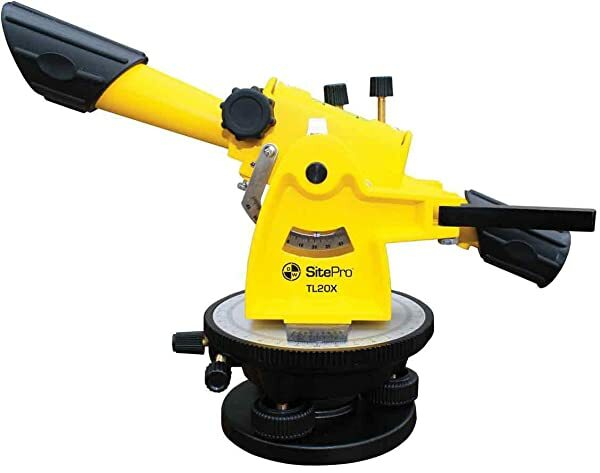 The SitePro 25-TL20X comes complete with clamps and tangents that bring your instrument – and you – quickly and effectively on target. Its 20X magnification enables a user to get clear images as far downfield as 200 feet or more. Its three-screw leveling base has a 5/8” x 11” thread for quick and easy mounting on a tripod. There is a built-in sunshade with a rubber eyepiece that assures you’ll be able to complete surveys accurately even when the sun is high in the sky. The truth is that this level may be worthy of consideration if it has the features that meet your specific needs. Users looking for the best transit level love this rugged instrument because of its sturdy design, its durability and its reasonable price. If it has the features you want, the SitePro transit level may be the right instrument for you. Incredible versatility makes the CST/Berger transit level extremely popular with builders, civil engineers and construction professionals. Unlike most of the other Transit Levels described in this article, this instrument can produce horizontal (level) measurements and vertical (plumb) measurements. Its effective range is 200 feet and its accuracy stands at ¼” per 100 feet. You can use the CST/Berger 54-200B transit level to level the ground (always its primary function), establish pitch and then set up your posts using the vertical application. It also includes a built-in 15-minute horizontal circle that enables you to set and establish rough angles. Additionally, its brass leveling screws assure fast, easy set-ups and durability. This instrument has been built to last which means it will serve your needs for many years. 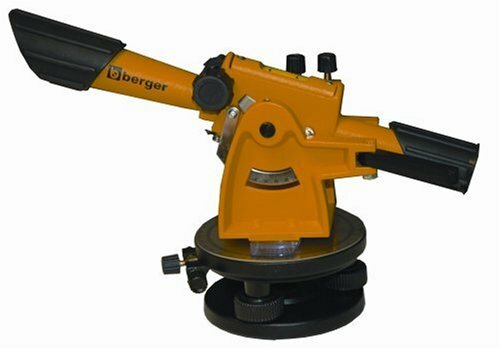 Users like this CST/Berger survey transit because it provides good value for the price and it is an effective tool for producing precise and accurate measurements. 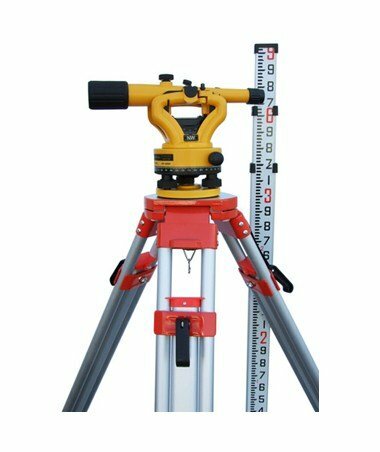 The fact that it can be used for vertical and horizontal applications makes it a good investment for your surveying projects. The NWS Siteline transit level, like most of its competitors, includes the kinds of features that make it practical for big construction and agricultural jobs. For instance, it includes 20X magnification which means you can get clear, precise images at long distances up to 200 feet away, often more than that. Its leveling accuracy stands at a commendable ¼” per every 100 feet of range. It is relatively lightweight at just 13 pounds and, as a result, is easily portable. You can take it with you wherever you go. In fact, its dimensions are just 11” x 5.5” x 7.5” and that means you can tote it easily while it’s tucked conveniently under your arm. The bottom line is that this survey transit level kit seems to fit basic needs. And that may mean that it is the right choice for you. Many builders believe that the NWI NSLP500B Siteline Transit Level has all one needs to effectively complete simple surveys. Those who own this instrument also like its rugged and durable tripod. If you are looking for an easy-to-use surveyors transit, this may be your best bet. DEWALT is famous for its high-quality products and this Dewalt transit level may be no exception. It is ideally suited for virtually all construction, civil and agricultural applications. The DEWALT DW092PK transit level is packed with many useful features, including 20X magnification capability for an effective range of over 200 feet, an accuracy of ¼” per 100 feet of range, a 360-degree horizontal circle with a Vernier scale that enables this versatile instrument to measure horizontal angles as well as vertical angles. It also has a rugged aluminum tripod with a heavy-duty leveling base that can be set up quickly and easily. This is one of the best transit levels from a major manufacturer that serves many purposes because it is versatile enough to handle a variety of big, medium and small projects. DEWALT has been in business for a long time and has a solid reputation. The company is known for producing quality products. Despite some drawbacks, this DEWALT DW092PK surveying transit level includes a broad range of features that enable users to produce consistently accurate measurements. If the product name seems familiar to you it’s because it is almost identical to one of the transit levels described earlier in this article. Yes, it’s the cousin of the DEWALT transit level. And, not surprisingly, it includes many of the same quality features. That means it has 20X magnification to a range of at least 200 feet. Its primary difference is that it measures level or horizontal lines while the Transit Level measures vertical lines. That’s it. 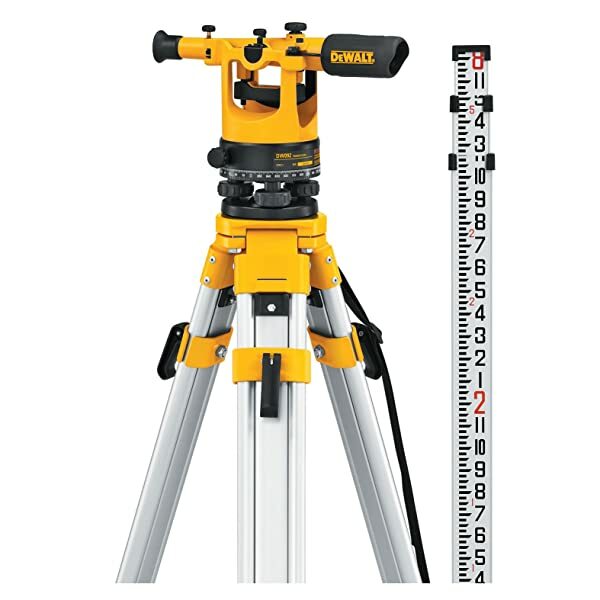 In fact, as is true for the DEWALT transit level, this builder’s level’s accuracy is measured at ¼” per every 100 feet and its 360-degree horizontal circle with Vernier scale produces precise measurements of horizontal or level angles. It has an aluminum tripod with quick-adjust legs for easy setup and an 8-foot rod. The DEWALT DW090PK Builder’s Level Kit features a protected leveling vial for jobsite durability. And it has a plumb bob and a rugged and durable kit box for protection during transport. 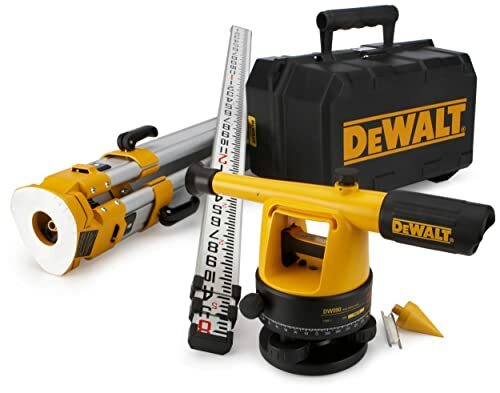 If you determine that you need a Builder’s Level, you may wish to consider this instrument from DEWALT. Those who own it, like it. You now have reviews of what we believe are four of the very best transit levels for sale. But, do you really know if you need a Transit Level for the work you do or a Builder’s Level? To begin, a transit level is basically a telescope with a built-in level that is mounted on a tripod. Its main uses are for surveying and building or construction. Transit levels differ from their more commonly-used cousins, builder’s levels because they enable you to take accurate vertical measurements. Whereas, a builder’s level is perfect for establishing horizontal measurements. A builder’s level is ideally suited for a broad range of construction projects, some large, others small. In a comparison between a Transit Level and a Builder’s Level, they both include many of the same features. The key difference is simple: A builder’s level can be used to establish horizontal angles. It features a 360-degree circle and is more flexible than a transit level. But it still only produces horizontal or level angles. A transit level is less flexible and can only produce vertical or plumb angles. That’s it. Once you determine whether you need to establish vertical or horizontal angles in the work you do, you’ll know which level is right for you. And if you should decide you need a Builder’s Level, here is one of the best Builder’s Levels currently available in stores or online. Builder’s Level vs Transit Level: Which one to choose? Each level has its limitations. And your decision needs to be based on your specific needs. If you need a level to establish horizontal or level angles, consider buying a Builder’s Level. If plumb or vertical angles are what you need to establish every day at work, you need a Transit Level. It really is that simple. Remember. The Transit Levels and the Builder’s Level described in this article are all packed with great features. In fact, the DEWALT Builder’s Level and Transit Level are nearly identical. The only real difference is that one excels at measuring vertical angles while the other is best used to establish horizontal or level angles. All levels, whether Builder’s models or Transit models are easy to set up, easy to read and easy to use. Most levels, in fact, come with an easy-to-understand user manual that will explain in detail (and often with diagrams) what you need to know and what you need to do. Take your time to read the manual slowly and carefully until you fully understand the instructions and the information it provides. The rest is easy. Keep in mind that the level you buy has been designed to help you do your job. Once you put it to work, it will become an invaluable tool that makes your job easier. Take this last step now.